Daily HHS call volume has jumped to about one call per 800 U.S. residents. (Bloomberg) – The U.S. Department of Health and Human Services (HHS) says consumers are swamping its call centers and HealthCare.gov enrollment website with efforts to apply for coverage. HealthCare.gov attracted about 1.1 million visitors Monday, the second most ever. The visitor count climbed to 1.2 million Tuesday. The number of telephone calls jumped to 390,000 — or one call for every 800 U.S. residents — from 350,000 the day before. State exchanges also were busy. Washington state enrolled 12,000 people last week, and Connecticut enrolled 1,200 people Monday. “The expected surge in last-minute enrollments has begun,” said Richard Onizuka, the chief executive officer for the Olympia-based Washington Health Benefit Exchange, in a statement. About 5 million people had selected individual “qualified health plan” (QHP) coverage through the Patient Protection and Affordable Care Act (PPACA) public exchange system as of March 17, according to HHS figures. The public exchange open enrollment period for individual QHP coverage began Oct. 1 and is supposed to end Monday. HHS will be letting consumers using the HHS-run exchanges apply for a “special enrollment period” through HealthCare.gov, without providing any special documentation, up until mid-April. Consumers who apply after mid-April may have to show that they qualify for an exemption from the usual application deadline. HHS Secretary Kathleen Sebelius visited Montclair State University in New Jersey Tuesday to observe local enrollment efforts there, while Obama’s senior adviser Valerie Jarrett met with local officials in Los Angeles at an event at a community health clinic, according to a White House statement. The Congressional Budget Office estimated before the QHP open enrollment period started that the issuers might attract 7 enrollees in 2014. 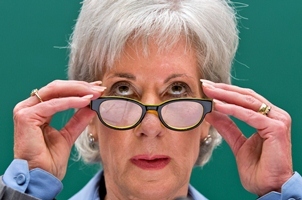 In recent weeks, HHS has suggested it might attract 6 million enrollees by March 31. Observers have noted that HHS is using whether consumers have chosen a QHP, not whether consumers have paid for QHP coverage, as the QHP enrollment activity indicator. Exchange program critics have suggested that the paid enrollment may be lower than the HHS plan section total. Peters, the HHS spokeswoman, said the government won’t know how many people have paid their first premiums until contractors finish building an automated system allowing insurers to exchange the information with the government. Until then, the data “is neither final nor complete,” she said. “When we have accurate and reliable data regarding premium payments, we will make the information available,” Peters said.